All of the Buffy and Faith figures come in a nice if a little plain clamshell with a picture of Buffy/Faith on one half, figure displayed proudly in plastic on the other. The back displays all of the super-articulated figures in the line as well as a little description of the two characters. Inside, the backing opens up as a brochure with details about other Buffy figures and minibusts. Overall, it's nice enough for the MOC collector but not as nice as the earlier carded MAC Buffy figures, but with plenty of protection in the clamshell. As previous, the bare-arm articulation doesn't look as great as the clothed arm concealed articulation, but the trade-off is no balljointed shoulders, but either way she looks very good; these are the best Buffy figures we've seen thus far. "End of Days" Buffy is loaded with movement and a whole heap of posability. Find her having a balljointed neck, shoulders (without coat) and legs, then jointed torso, upper-arms, upper-legs, knees x 2, elbows x 2, wrist x 2, feet x 2 and toes. Her body is highly durable and great for play or display; as the standard for this series, Diamond have done a great job in making a fun and displayable figure. Like "Graduation Day" Buffy, "End of Days" Buffy features a great melancholic Sarah Michelle Gellar likeness. (There's been some fan debate about the blank look she sports, but it's fine; it's all subjective - you like it or you don't, your call.) 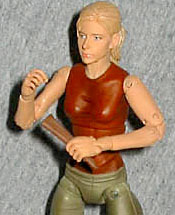 Her hair is done up in a ponytail and the paint apps are great; below the neck, she features the same great body as the other superposeable BtVS figures, painted and detailed in slightly less dark colors than the earlier-season kin. There's no mistakes or overspray on mine, although some collectors reported that the hair paint must have been still wet in the package and has ended up staining the jacket, but I didn't have that problem. 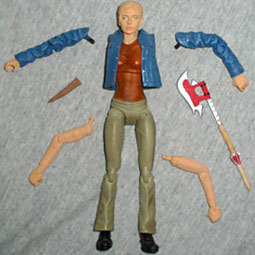 Aside from the extra arms/jacket deal, "End of Days" Buffy comes with two weapons, the awesome Slayer Scythe and a wooden stake. 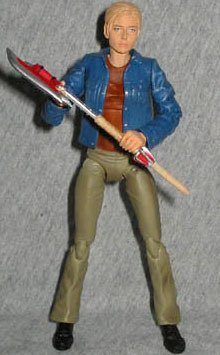 The Slayer Scythe first showed up in Joss Whedon's slayer-comic Fray, and then found its way into the final season arc of the Buffy TV series, playing a major part in the final episodes. (It was also used to cut Caleb the evil preacher in half, from the groin up in a single swing. Ouch.) The sculpting and detail on this is fantastic, and it's the perfect accessory for the figure. This is a great figure from Diamond and it really whets the appetite for the other superposeable Angel and Spike toys. The original price over on TowerRecords.com was under $12, which was a great price; she and Graduation Day Buf make an awesome set and you end up with two armed Buffy figures from different times in the exceptional series. Very recommended!